Oh well, yet another #bakingtrio project with J and CL following Cupcake Jemma's awesome recipe (for lemon curd)! But before we get to that, let's get over with the ingredients! First up, let's make the lemon curd! Into a heat-safe bowl, add in the lemon juice, lemon zest, sugar, eggs and egg yolks. Give it a quick mix and set it over a bain marie (make sure the bottom of the bowl doesn't come into direct contact with the simmering water) and just keep stirring until it thickens up, which should take you at least 5 minutes. Then, take the curdled mixture off the heat and dump in the cold butter (helps to cool down the mixture) and stir until all the butter has been incorporated. The mixture may be a little lumpy, but fret not. Just push it over a sieve and tadaa~ a beautiful bright yellow and smooth lemon curd is done! This recipe will give you way more than the amount required for 10 tarts, so do store the extra into a proper container and keep them in the fridge. You can have them with some scones, toasts, or even make some lemon curd muffins later on! And after we have the lemon curd out of the way (and chilling in the fridge), it's time to get the tart shells done! In a bowl, add in the dry ingredients and give it a quick whisk to make sure they're well combined. Then, cut in the cold butter cubes, either with a pastry cutter, a fork & knife combination, food processor, or simply by just rubbing with your fingertips until they resemble coarse crumbs. Then, add in the egg yolk and LIGHTLY knead/pat until the mixture comes together into a dough. If your mixture is way too dry and just cannot form a dough ball, add in just enough milk for the dough ball to form. Then, wrap the dough ball in cling wrap and set it in the fridge to rest for 20 to 30 minutes. After the dough has rested and get slightly chilled, roll it out to 1/4 inch thick and cut out 10 circles using a big cookie cutter (the cut-out should be bigger than your tart tins/muffin tin wells) and press them into your tart tins/muffin tin wells. The ends should preferably extend just a little beyond the edge of your tins, as they will shrink as they bake. Then, poke a good amount of holes on the base of the tart shells (with a fork) and set them to bake in an oven pre-heated to 180 degree Celsius for about 15 to 18 minutes, or until the shells turn a lovely golden brown colour. You may set a small piece of baking paper into each tart shell and add baking beans or rice on top to prevent the tarts from swelling up while they bake. We didn't, and they did puff up abit. But since it's going to get covered in lemon curd in the end, it really didn't bother us. 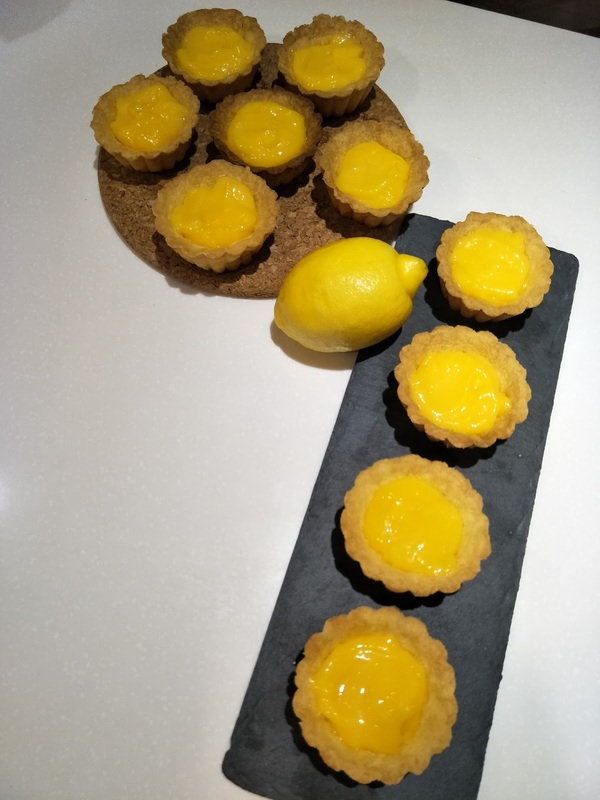 So after all the tart shells has cooled COMPLETELY, spoon your desired amount of lemon curd into each tart shell and add any topping you desire (blueberries, mint leaves, or even just a sprinkle of icing sugar). 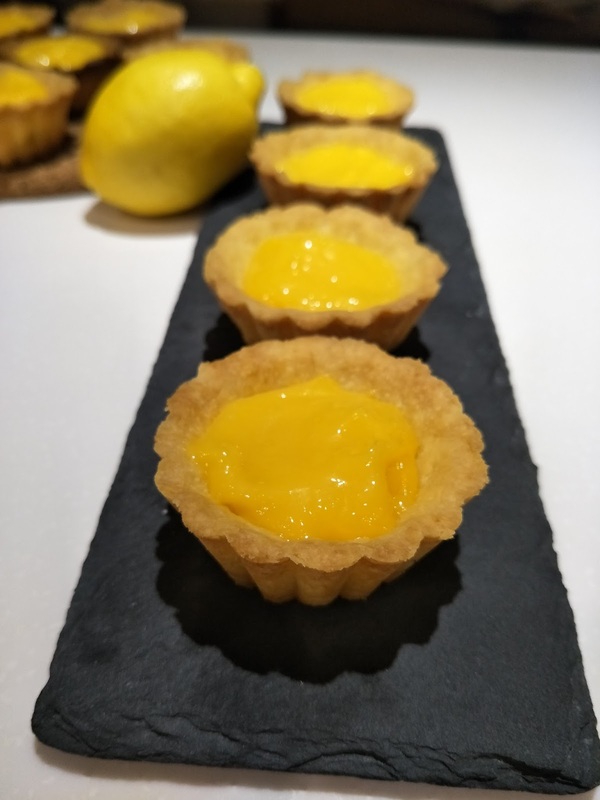 And these are SO GOOD, the tart shell is extremely fragrant, crumbly and tender and yet holds up well to not just disintegrate as you bite into it. The lemon curd is smooth and with a strong sourish kick. I've used the rest of the lemon curd to make some lemon curd pound cake the following week and they were great too!